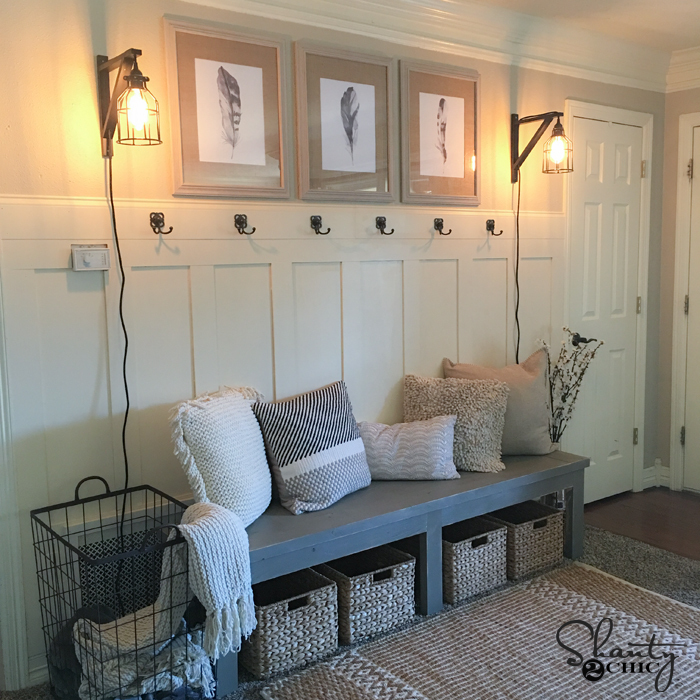 I have wanted to do a board and batten wall ever since I saw Whitney and Ashley do one. If you don’t know these fabulous ladies, they are the Shanty 2 Chic sisters and one of my biggest DIY idols. There hasn’t been one project that these ladies have created that I haven’t totally fallen in love with. I totally love their style! This is their board and batten wall. Unfortunately, my entry way is not this large, but on the plus side — my board and batten wall only cost me $17! Yup, you read that right — $17!!! And not to mention, it totally transformed this space. Take a look and see how I did it! This is seriously so easy, too! The first thing I did was measure the length from one side of the wall to the end and then using a mitre saw I cut my piece of MDF board to my measurement. I used my air nailer to attach the piece of MDF to the wall. Unfortunately I have a light switch there so that kind of dictated to me how high I could go up. I could have framed it in my board and batten wall but that would have made for more work. Next I measured from the underneath of the MDF board to the top of my base board and cut a piece to fit. I cut three more and nailed them to the wall evenly spaced. I used some Behr primer and painted the inside white and gave the MDF boards a fresh coat of paint. Note: you could cut and attach a large piece of MDF to go behind your panel pieces, but I wanted to keep this as inexpensive as possible so I just painted the wall. Once the primer dried, I followed it up with a coat of just regular flat white paint. And here she is all done! Not that I have a large entry way by any means but I am totally in love with this space now! If you like this make sure you save it for later! I love board and batten too! Your entrance looks awesome! I love the saying you have above it! I screenshot it so when I move to a smaller house after my daughter goes to university I can make one for my new house! Thanks for the inspiration! You are most welcome! Thank you for you kind comments! Oh my gosh, I LOVE THIS. Swoon! I’ve been meaning to make a front entryway area ever since we moved in. Our stuff ends up in the general direction of the door and closet, but it never lands in a good spot. Thanks for the inspiration! The price is right too. The price is sooo right!! 😉 Thank you so much for your kind comments! When you make your front entryway feel free to share a pic! !